The clip you see at the top of this post is our PopCult Instant Video of the 2012 HallowEast Zombie Walk, which took place less than 24 hours before this was posted. 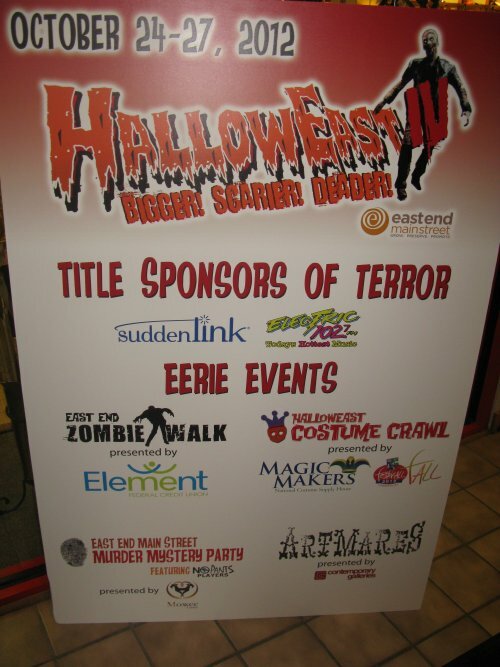 This year’s Zombie Walk started at Moxxee, the East End’s ultra-hip coffee shop, and meandered down Lee, Bradford, and Quarrier Streets before ending at the HallowEast Costume Crawl on the corner of Elizabeth and Washington Street. As always, it was tremendous fun seeing all the ghouls and zombies and zombie hunters come out for the annual shamble. One nice addition this year was that the route took our undead friends through a residential section and the residents played along just fine. In this clip, you will see the Cemetery Knights hearses, Carl from “The Walking Dead,” a zombie chain gang, a zombie alien on a leash, a few zombie hunters, and a few wholesome zombie families. And that’s just the tip of the iceberg. If you watch closely, you may even see East End Main Street’s Ric Cavender and HallowEast’s proud papa, Mark Wolfe, sprinkled among the rotting crowd. Our music is part of a contest this year. The first person in the comments section who can identify the source of our music will get a free Basil Wolverton “Space Hawk” comic book, worth an estimated fifteen cents. Since YouTube now lets us get away with murder in terms of running times, in the next day or two we will probably post all our unedited raw footage, with no background music, so you can enjoy the unedited Zombie Walk experience and overhear all the inappropriate conversations that our cameras accidentally picked up.